Shop for authentic replica Commodore Perry flags. 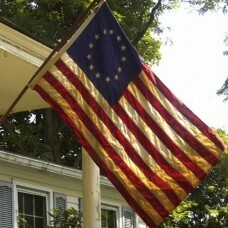 Our Commodore Perry flags are constructed of durable nylon with a canvas heading and offered in five sizes. The Commodore Perry Flag is one of the most iconic of any flag associated with the United States Navy. 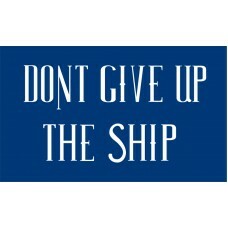 It is a simple blue design with the words "Don't Give Up the Ship" emblazoned in white. It has no other design features. This simplicity marks the Commodore Perry out from most other naval, military and civilian historical flags. The phrase pre- dates rallying calls such as "Remember the Maine." Commodore Matthew Calbraith Perry served in the United States Navy from 1809, although the flag named after him is associated with an event much later in his career. Also, while the flag is associated with Commodore Perry, in fact its origins lie with previous naval commanders. Perry is credited with managing to open up trading links between the USA and Japan. He negotiated the Convention of Kanagawa in 1854. This is credited as heralding Japan's entry into the world trading system, after a long period of isolation. As with much else involving historical flags, historians today argue about the actual truth of such events. At the time of the Kanagawa treaty, Japan was ruled by a Shogun emperor. Commodore Perry obtained the treaty while the Shogun Tokugawa Leyoshi was seriously ill. Perry negotiated with Hayashi Akira, who convinced him he had the authority of the Shogun to sign the treaty. In fact, historians now say that the Shogun had given no such permission. Whatever the technicalities of the Convention of Kanagawa, there is no doubt that Commodore Perry was an extremely brave naval officer. He set sail for the Far East from Norfolk, Virginia with a paddle steamer, the Mississippi, as his flagship. On his first visit to Japan in 1852, his small fleet harbored in Madeira, St Helena, Cape Town, Mauritius, Ceylon (Sri Lanka), Singapore, Macao, and Hong Kong. Perry was 56 years old at the time. While Commodore Perry carried the "Don't Give Up the Ship" flag to Japan, it is thought that the slogan first appeared much earlier. This was in 1813, shortly after Perry began his naval career. The phrase is said to have been uttered by Captain James Lawrence, commander of the frigate Chesapeake. This was after an encounter with a British frigate near Boston left the vessel badly damaged. Captain Lawrence died shortly after, and his crew ignored his order. They surrendered the Chesapeake to the British. The phrase itself quickly became part of the folklore of the US navy. It represents bravery in the face of death, and a determination to defend the fleet at all costs. Translated into modern times, the Commodore Perry flag has a similar appeal to lovers of history and country alike. It is a very popular collector's item, with a unique design. It is admired as a reminder of past achievements and a simple call to action. Whatever the truth of events associated with it, the Commodore Perry remains a firm favorite with collectors and buyers.